Letter #28 is much as the others during John's convalescence at Georgetown College Hospital in Washington. 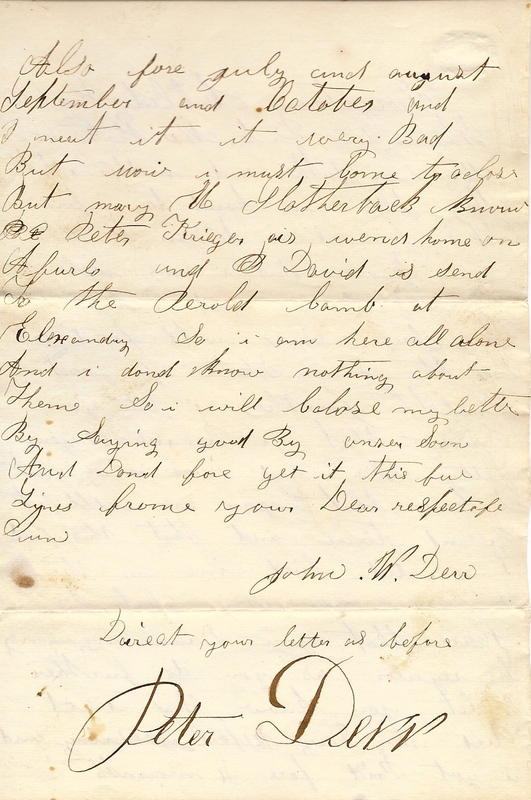 A short letter...just keeping in touch with the family, and passing along information to them regarding other neighbors in the Deep Creek are. In this case, John discusses David and Peter Krieger who were both wounded along with John at the Second Battle of Bull Run. 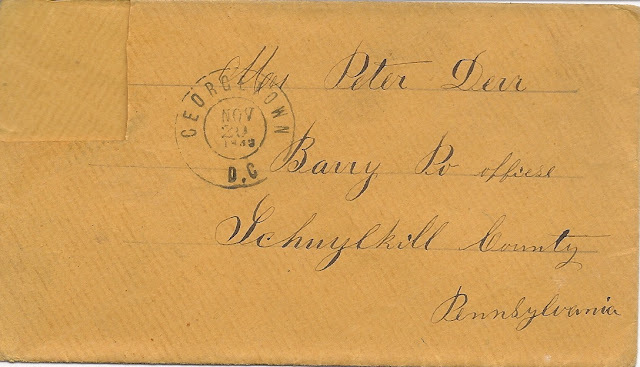 Though I do not have any further information about the circumstances, I assume that David Krieger was both wounded and taken prisoner based on him being sent to the the parole camp in Alexandria. David Krieger was fortunate to receive a furlough to return home for part of his recuperation from his wounds. 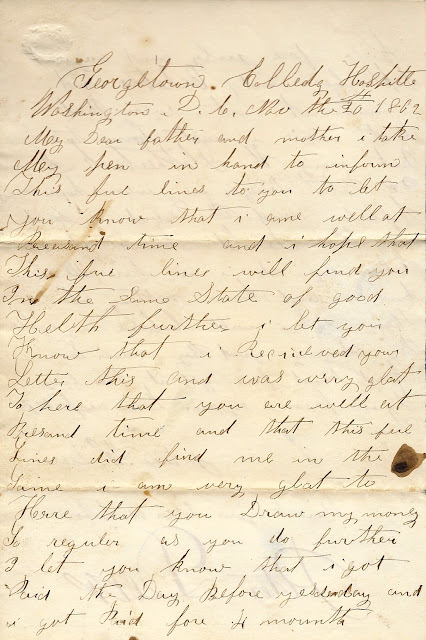 Mary Slotterback is mentioned again in the letters and I am not sure of the relationship between Mary and the Kriegers. 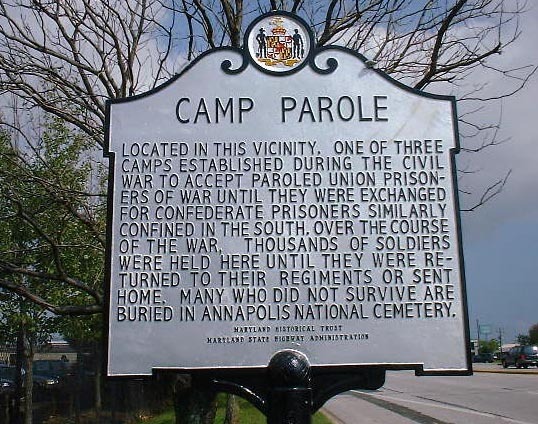 During the early part of the Civil War, the North and the South used the European system of prisoner exchange via parole camps. This process allowed for the orderly exchange of prisoners on a one-for-one honor system basis. There were rules regarding the exchange and violations of these rules by either side could result in a collapse of the system and a negative effect on each side's captured soldiers. Additionally, a collapse of the system would have a devastating effect on the active duty soldier who viewed paroling as a better option than fighting a needless specific battle to the death. Later in the war, General Grant decided that the North had the advantage of numbers and resources, and decided to end the prisoner exchanges. 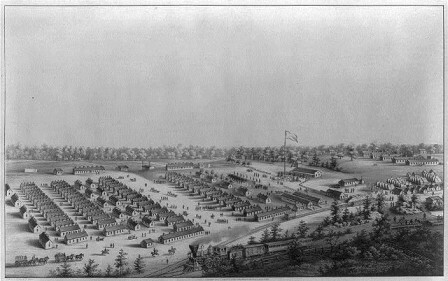 While it had the desired affect of attrition, it also helped spawn nightmares such as Libby Prison in Richmond and the infamous Andersonville prison in Georgia. Lacking a means for dealing with large numbers of captured troops early in the war, the U.S. and Confederate governments relied on the traditional European system of parole and exchange of prisoners. The terms called for prisoners to give their word not to take up arms against their captors until they were formally exchanged for an enemy captive of equal rank. Parole was supposed to take place within 10 days of capture. Generally it was granted within a few days, especially after a major battle where thousands of troops were involved. Sometimes parolees went home to await notice of their exchange; sometimes they waited near their commands until the paperwork was processed. The system grew increasingly complex, cumbersome, and expensive as the war progressed and the number of parolees soared. The prospect of being sent home encouraged many men to allow themselves to be captured in battle or by straggling. Some parolees were permanently lost to she army when they failed to return to their units. Detention camps established by Federal authorities angered parolees, as did attempts to use them as guards, send them west to fight Indians, or give them noncombat assignments. Technically, paroled troops could not be given any duty that would free other soldiers for combat, an interpretation upheld by military courts. While paroling was in force, many inequities surfaced in the system. Soldiers assigned to detention camps frequently suffered from shortages of food and clothing and poor sanitation and were victimized by a criminal element among them. The men often became pawns for the governments, officers at one point being denied parole until formally exchanged. Union authorities generally withheld parole and exchange from guerrillas, bushwhackers, and blockade runners, which resulted in retaliatory action by the Confederacy. Finally admitting that the war was being prolonged by returning men to the ranks through parole and exchange--which by 1863 was the Confederate army's principal means of maintaining troop strength--Federal authorities severely restricted the program. The alternative, confining captured enemy troops to prison camps, became policy for the 2 belligerents. I take my pen in hand to inform this few lines to you to let you know that I am well at present time and I hope that this few lines will find you in the same state of good health. Further I let you know that I received your letter this day and was very glad to hear that you are well at present time and that this few lines did find me in the same. I am very glad to hear that you draw my money so regular as you do. Further I let you know that I got paid the day before yesterday and I got paid for 4 months. Also for July and August September and October and I need it very bad. But now I must come to a close. But let Mary M. Slotterback know Peter Krieger went home on a furlo and David is sent to the Perole Camp at Alexandra. So I am here all alone and don’t know nothing about them. So I will close my letter by saying goodbye. Answer soon and don’t forget it. This few lines from your respectful son. Direct your letter as before.